Pathogenicity of Pseudomonas aeruginosa, a major cause of many acute and chronic human infections, is determined by tightly regulated expression of multiple virulence factors. Quorum sensing (QS) controls expression of many of these pathogenic determinants. Previous microarray studies have shown that the AmpC β-lactamase regulator AmpR, a member of the LysR family of transcription factors, also controls non-β-lactam resistance and multiple virulence mechanisms. Using RNA-Seq and complementary assays, this study further expands the AmpR regulon to include diverse processes such as oxidative stress, heat shock and iron uptake. Importantly, AmpR affects many of these phenotypes, in part, by regulating expression of non-coding RNAs such as rgP32, asRgsA, asPrrF1 and rgRsmZ. AmpR positively regulates expression of the major QS regulators LasR, RhlR and MvfR, and genes of the Pseudomonas quinolone system. Chromatin immunoprecipitation (ChIP)-Seq and ChIP-quantitative real-time polymerase chain reaction studies show that AmpR binds to the ampC promoter both in the absence and presence of β-lactams. In addition, AmpR directly binds the lasR promoter, encoding the QS master regulator. Comparison of the AmpR-binding sequences from the transcriptome and ChIP-Seq analyses identified an AT-rich consensus-binding motif. 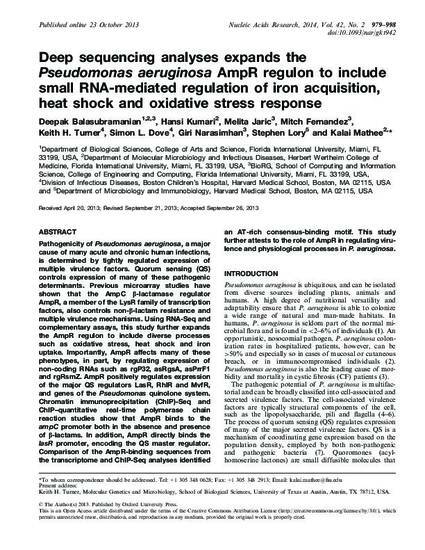 This study further attests to the role of AmpR in regulating virulence and physiological processes in P. aeruginosa.